This exhibition was drawn from the Timkov Collection of Timothy and Lisa Wyman and features remarkable landscapes by renowned Russian painter Nikolai Timkov (1912-1993). Nikolai Timkov was born to a farming family along the lower Don River prior to the Russian Revolution. This influence can be seen in his remarkable depictions of small communities, winter landscapes, and the Ural Mountains. Timkov studied at the Academy of Arts in present-day St. Petersburg. He was influenced by the works of great Russian landscape painters, among them Levitan, Shishkin, and Brodsky. During the course of his long career he also incorporated elements found in works by French Impressionists. 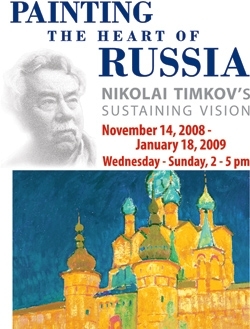 This exhibition was created in partnership with the Embassy of the Russian Federation, and it was co-curated by Dr. Alison Hilton, an eminent scholar of Russian art history and Chair of the Department of Art and Art History at Georgetown University. Major sponsorship was provided by ExxonMobil, Mr. Raymond Garcia and Dr. Fruzsina M. Harsanyi, Tyco International, Mr. and Mrs. Michael Sonnenreich, and Timothy and Lisa Wyman.